Let’s start with some coolness from the Jim Henson company. They’re using a new technique called “Digital Puppetry”. Very cool. The stage actors have motion capture suits on which are translated in real-time to digital characters. The coolest is the voice actors manipulating some strange hand contraption to control facial movements. Not sure if these are “official” renderings, or just someone’s wishful thinking. 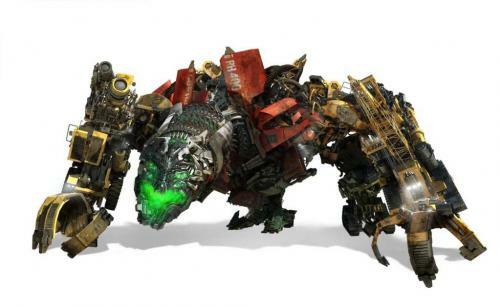 The image below is of Devastator. Also available is Ravage, Starscream, The Fallen, The Twins, Megatron, Ironhide, Ratchet and Sideswipe. See the other images over at MovieChronicles (via sci-fire wire). I gotta say, the latest round of cartoon movies featuring comic books characters has been amazing. Superman: Doomsday, Batman: Gotham Knight, Wonder Woman, Hulk vs Thor, and Hulk vs Wolverine have all been fantastic. They really give a great sense of epic-ness (is that a word?). There is nothing like watching Superman punch Doomsday *through* a building. Or Hulk literally pounding Thor *into* the ground. This new video looks like it’s in the same vein. We’ll see. I have not previously heard of this movie. Starring Johnny Depp and Christian Bale, it’s the story of John Dillenger. The trailer (in tiny window to the right) looks pretty good. Some clips have popped up around the internetwebiverse with a few small clips from the movie. AICN has them collected here. « Way to go, France?